Historically, Cuban cuisine has not been highly regarded–perhaps for legitimate reasons. Until recently, most restaurants were government-run and not subject to competitive forces, and many government-run restaurants are designed to deliver cheap calories to the crowds rather than to showcase culinary innovations. Furthermore, Cuba has a limited domestic food manufacturing capacity, so many food items must be imported. As a result, those items are expensive and (due to shipping times) often stale. Even for food manufactured in Cuba, poor food distribution chains hinder the quality of domestically manufactured food. Finally, Cuban chefs inexplicably don’t use a lot of spicing, so dishes are bland. Cuban vegetarian cuisine suffers from all of these problems and more. Without a large customer base of vegetarian customers, most Cuban chefs don’t understand vegetarian needs. As a result, many restaurants don’t offer vegetarian options; and at the restaurants we visited, the rare vegetarian options appearing on Cuban menus were completely uninspired and uniformly terrible. [I'm sidestepping the challenge of confirming that seemingly vegetarian options don't surreptitiously contain meat, which is difficult due to both language and cultural barriers.] The thinly stocked markets had very few non-junk-food vegetarian options, typically imported and expensive. The lack of vegetarianism in Cuba is all the more perplexing given the government’s central planning role. The production of meat requires substantially more resources than the production of non-meat options (see, e.g., this page from PETA). With the Cuban government so resource-strapped, wouldn’t it make financial sense for the Cuban government to centrally decide to produce more vegetarian options and produce less meat? Of course, the cost-benefit calculus isn’t so simple. Meat plays an important part in the Cuban diet and culture. While meat may be expensive resource-wise, the government simply can’t unilaterally ignore important cultural considerations. Still, why did the Cuban diet become so unfriendly to vegetarianism? The answer, I believe, lies in the type of cultural determinism I previously discussed regarding the dead hand of the municipal planner. When the Cuban government moved to centralized planning, it made infrastructure investments and resource allocations based on the prevailing norms of the time–including, in this case, the role of meat in Cuban cuisine. Once made, the government lacked the funds to revise those investments over time. The result is the culture/cuisine and the government’s resource allocations become interdependent–and mutually stagnant. The government’s resource allocations don’t change in a way that spurs cultural changes, and there aren’t a lot of exogenous cultural changes to spur government resource reallocations. In this case, there’s little consumer demand for vegetarian options; and without a change in the government’s resource allocations to make vegetarianism easier and cheaper, it’s unlikely that consumer demand will materialize. (Indeed, in the 2000s, the government launched several vegetarian-only restaurants in Havana; all of them failed and switched back to serving meat). There are many reasons to oppose socialism, but I hadn’t fully appreciated the stifling nature of its cultural ossification and cultural determinism until visiting Cuba. With limited government-subsidized vegetarian options, eating vegetarian is an expensive luxury. For example, we stopped at a lovely farmer’s market with a decent array of options, but prices were comparable to those in the United States, well out of reach of Cuba’s lower class and perhaps prohibitive even to Cuba’s (small) middle class. 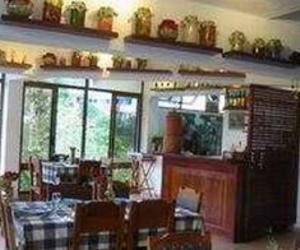 One of Havana’s two vegetarian-oriented restaurant (La Buena Vida in Havana’s Miramar district)—a paladir, a non-state-run restaurant in someone’s private home—was also financially prohibitive to most Cubans. (That, and the terrible food, might explain why we were their only customers the night we went). In contrast, the ubiquitous government-subsidized restaurants offered cheap options like ham and cheese sandwiches, even though the government’s production costs surely vastly exceed the production costs of equivalent vegetarian calories. Ironically, it’s cheaper for Cubans to eat meat than to be vegetarian, even though the social costs of that consumption pattern are the opposite. We did find one acceptable vegetarian restaurant outside of Havana, El Romero, at an eco-resort called Las Terrazas. Presumably catering principally to international tourists and facing limited competition from other local restaurants in the small tourist-oriented town, the restaurant has found a way to stay in business. I asked the owner why there weren’t more vegetarian offerings in Cuba, but I didn’t get a clear answer. I did learn, however, that he wasn’t a vegetarian at home.